Last night I went to the grand opening of the "official' Poker Dome at Neonopolis. As you know they've been filiming from their make shift dome at the Tropicana. The new dome at the intersection of Las Vegas Blvd and Fremont Street is leagues better than the temporary one. As you can see from this picture, it is a major production. It took them five months to reconstruct a cinema to suit their needs, and in the control room, there are more TV monitors than there are behind the scenes at the Superbowl. Tonight is the first televised event. If you're in town, go down to Neonopolis and see if you can get a seat. European champ Tony G will be playing. He actually won his seat from a one cent tourney on Mansion. "I look so mean." Jen Leo was right. The normally affable Jen had been replaced by a steely, ice cold, poker princess. I was taking pictures of the television all night and this was the only glimpse of a smile I could catch. All the rest of the time, Jen looked like she was going to rip the hearts right out of her opponents' chests. Last night, Jen's episode of Poker Dome aired. I had watched the taping, but it was so much more fun to watch it with her friends and housemates; cheering, teasing, and drinking are always welcomed additions to any poker viewing. Jen was so incredibly card dead. She definitely caught the raw end of the deck all night. But she held in for a strong 3rd place showing with bold steals and perfectly timed continuation bets. Jen wasn't the only blogger caught on television last night as Pauly and Poker Shrink made some crowd shots. I, however, managed to escape the paparazzi for one more day. Today is my big day. 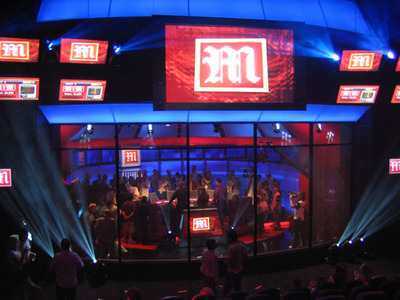 As I think you already know, I won a seat into the Mansion Poker Dome to air on FSN July 23rd. Yesterday I was at the World Poker Blogger Tour and there will be a bunch of poker bloggers at the Dome. It's going to be so much fun! So far, I know that I'm up against a magician (Dan), and a semi pro football player (Neil). There is a middle aged guy and another young buck who has been chiming in on JenLeoLive!. They filmed us yesterday doing an interview where I talked about my books, and did some absolutely ridiculous poses like crossing my arms and glaring into the TV. This, I have no doubt, will garner huge laughs from the viewers come July 23rd. But the good news is that the producers were talking amid themselves and said that I was "very photogenic" so hopefully they'll just get me smiling. So, right now I'm off to breakfast to meet the other players and get our schedule, then it's off to get my hair done again, and at 1pm the limo will take us to the Tropicana to get ready. Some bloggers will be showing up at the Tropicana at 4:30pm, but you need to be there at 5:00pm to get your seat. Don't worry, there will be a comedian in the audience to warm you up, and if you want to be on TV, sit in the front and center rows. See you there! Wish me luck!